The kesa is the robe of transmission of the Buddha’s lineage, transmitted through ancient Zen masters up to the present day. To practice with the kesa means that we have felt the true spiritual dimension of zazen. From ancient times, the kesa has been called the “robe of detachment”, because when a person wears a kesa, suffering arising from bonno, from karma, disappears. Faith is important. The rakusu is a miniature kesa. When we want to receive ordination as a bodhisattva, in addition to participating in the Dharma Workshops, we sew a rakusu. When we receive the rakusu, it is inscribed by hand with our name, the master’s name, the date, the place, and a calligraphy that expresses a Zen teaching. 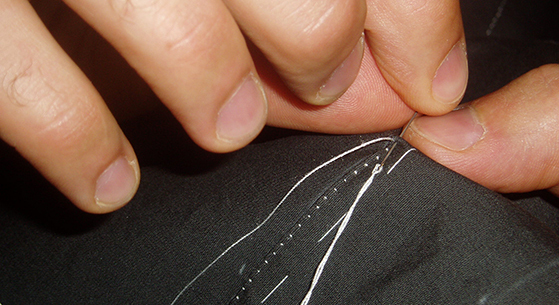 Sewing the rakusu and kesa is a part of practice. We sew our rakusu or our kesa, but while we sew, we do it for others. We sew just for the sake of sewing. The sewing workshop to learn about how to sew our rakusu, takes place every Friday and Saturday at 18:15. Please inform us before coming.